Not all boxes are created equal. Beware of the many fakes that are being sold as authentic Limoges boxes, especially on some of the auction sites. Thanks to Tom and Keith Waterbrook-Clyde for the pictures below and the associated description. 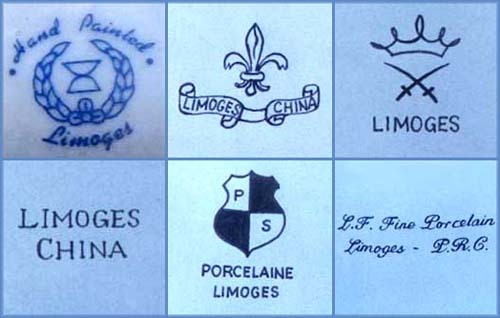 For more information on Limoges boxes, be sure to check out their book. These marks are from porcelain pieces, which for the most part probably originate in Asia. The PRC stands for People's Republic of China, and the mark with the fleur-de-lis is from Taiwan. There is another "fake" mark (not shown here) which reads "Amoges" but looks like "Limoges." Porcelain pieces with these marks are NOT from Limoges, France.